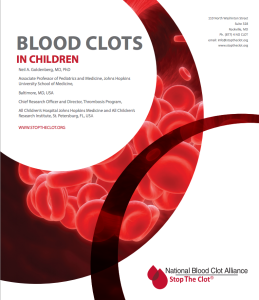 Home / About Clots / Blood Clots in Children Resources / How long will your child need to remain on blood thinners after a blood clot? Clinical Trial: Research to test whether a drug or medical device or procedure is safe +/- effective. Provoked blood clot or VTE: A blood clot caused by certain health conditions, procedures, or medications, such as infections, “central line” catheters, recent surgery, and birth control pills. Unprovoked blood clot or VTE: A blood clot not caused by any known health condition, procedure, or medication. As mentioned above, blood thinners reduce the risk of new blood clots. Your doctor will base the length of time your child needs to take blood thinners on the time your doctor believes your child is at a higher risk for new blood clots. This decision also involves balancing the higher blood clot risk with the risk of bleeding while your child takes blood thinners. We know of no perfect way to measure or predict how long children face a higher risk of blood clots. It is also difficult to balance that risk with bleeding risk. Clinical trials provide several recommendations for adults with blood clots. Adults with a first provoked blood clot should take blood thinners for 3-6 months. Adults with a first unprovoked blood clot generally should take blood thinner for 6-12 months. Recommendations to treat blood clots in children exist. We follow recommendations similar to the recommendations listed above for adults. However, clinical trials are underway in children with blood clots, to find out how long to treat with blood thinners.